Sleeping under the stars with a baby is enjoyable if you harness the improviser in you. 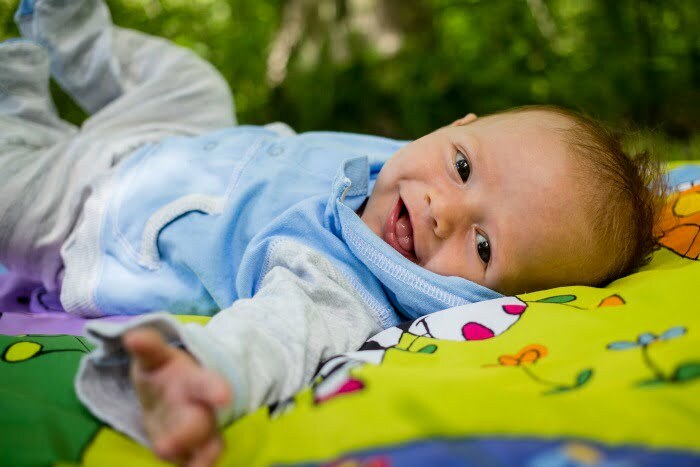 My friend, Samantha Crowe, looks back on her first camping holiday with a baby and suggests five tips to making it a success. I am normally a reluctant camper. I don’t need creature comforts but I do need to be dry, warm, near a hot shower and never far from a cup of tea. So when I found myself saying ‘The weather is going to be good this weekend. Shall we go camping?’ I’m not surprised that my husband asked me if I was alright. I can’t explain what came over me, especially as our baby had only just turned 6 months. Perhaps motherhood had dislodged the camping brain cell. Whatever it was, my husband jumped on the idea, so rarely did the chance come up to sleep in the great outdoors. And so the adventure began. A pitch in the New Forest was booked and the organising started. And my goodness what organisation it took. But it was well worth it, as it made for a memorable first camping trip with our baby. Waking up as the sun rises is magical, sitting under the stars beside a fire and wrapped in a blanket is super. You soon realise that your fellow camping families have been in your shoes – we didn’t bat an eyelid when toddlers cried and I can’t imagine their parents noticed when our baby was unhappy. You just get intoxicated by the fresh air, the freedom of no chores or technology, and some good old fashioned fun. My advice is to do it. Warm British summers are too short not to, and after doing it once you will have everything ready to go for the next warm-weather-whim. Here’s what I learnt from our first camping experience with a 6 month old baby. Look for a site that meets your needs and is reviewed for family friendliness. Coolcamping.co.uk is a good starting point. We knew of a perfect site for us; one which only accepted tents and campervans, where couples can camp away from families so you don’t disturb the peace, with generous pitches so you aren’t on top of other people, has hot showers all day, has a good mobile farm shop each morning, sells charcoal, has a freezer to recharge cool packs, and is perfectly placed for walking and cycling. I’m a big list lover, and I made loads of lists about everything we would need to take. We looked at any overlaps to reduce kit, for example doubling up a washing up bowl as a baby bath. And as crazy as it sounds, tick things off the list as they are packed into the car. I say this with hindsight, see number 4! Putting things in storage boxes saves you from going around the twist. It’s best to have a box for cooking utensils, baby stuff, camping kit, dry food, and a cool box. You can then find things day or night and your pitch is tidy. I found it handy to think about what we would cook, what we could buy from the farm shop, and therefore what we needed to keep refrigerated. Probably our best idea was to use a cool box you can plug into the car and put our meal for our arrival night in it. I then put a frozen meal for the next day on top with extra cool packs. Our frozen dinner kept the box cool after it came out of the car and it was defrosted perfectly the next day. I went with a mix of home cooked food and shop bought baby food pouches, but the trickiest thing was not having a high chair. Picnics don’t work with babies, once we learnt that we used the buggy and didn’t look back. Don’t do as we did and forget to pack a travel cot or any of your clothes! But if you do, don’t panic. You’ll be amazed how you can improvise. My ‘in case of’ blankets made a perfect nest of a bed for our baby, and we found you are actually never far from a supermarket that sells clothes to tide you over! A buggy liner worked as a sleeping bag. We weren’t very professional compared to some families (it would never have occurred to me to take fairy lights for our tent), and we might have forgotten a few things, but it didn’t spoil our weekend and we relaxed into it quickly. Who cares how other people camp, it’s half the adventure that you do it differently. In terms of baby routine, we did slip bed time to later in the evening. Thomas was too excited to sleep – just mesmerised by the other children playing. He also woke early, but so did everyone else. Before we booked we applied a ‘what’s the worst that can happen?’ test. A disturbed night was our nightmare scenario, but we said to ourselves we could take the baby for a drive, and if it was really bad we wouldn’t risk a second night but pack up and go home. Thankfully it didn’t even come close to that, in fact we think he did some of his best sleeping in the fresh air! 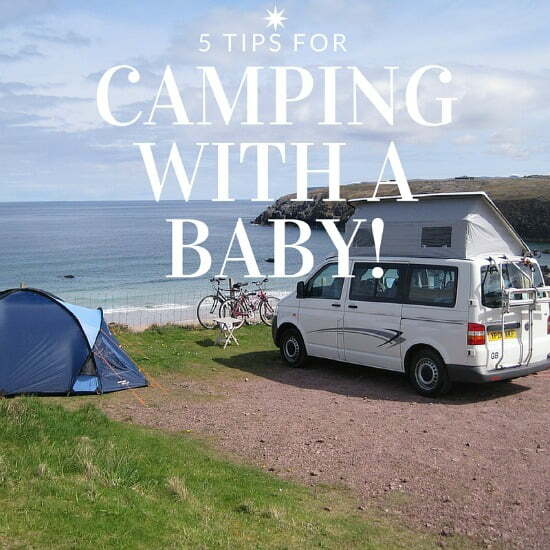 Have you got any tips for camping with a baby? Were there any essential items which you’d like to share with other parents thinking about taking their baby camping? I think you do need to plan camping with a baby. I love the double up bit of a washing up bowl andf a bath. Very sensible. Thanks for sharing your tips on Country Kids and happy camping! We have promised to go away next year with friends, and our four children. That will be a camping trip and a half, especially as I am no natural camper! Just reading your tips (what can I say? I’m a planner…) and feeling a bit more reassured. Glad you are feeling more reassured. I think that the kids in particular will love camping. They say ‘nothing ventured nothing gained’ so good on you for giving it a go. I’ve been camping with both my kids as small babies and they always love it. I find we generally get a better night’s sleep too!